Apple and Samsung Electronics won't be able to keep certain pieces of information from the public during their high-profile jury trial that begins on Monday, a judge in California said Friday. But what will be public and what won't still isn't known. The judge set several deadlines over the weekend for Apple's and Samsung's lawyers to submit arguments to the court so that decisions can be made before Monday morning. The two companies had previously asked for chunks of information in documents to be redacted and for certain items of evidence to be sealed so they would only be seen by the jury, judge, and lawyers involved in the case. Judge Lucy Koh, presiding over the case at the U.S. District Court in San Jose, said she will allow some source code, royalty rates and unreported financial data to be sealed. However, she said she would need to see and review the documents before accepting the requests. Most information will have to be public, she said. She also limited the volume of evidence. Both Apple and Samsung had been liberally redacting documents and asking that others be sealed before Reuters filed papers with the court objecting to the classifications being made. For example, in one filing earlier this week, Apple redacted a key figure in its damages claim against Samsung, but went on to list additional damages of $500 million and $25 million and then noted the total was $2.525 billion. Simple subtraction showed the missing figure was $2 billion -- something subsequently confirmed in an unredacted filing. Some images purportedly of future products were also revealed. Koh twice noted that some of the information that the companies claimed as confidential was found in public submissions to the U.S. Securities and Exchange Commission. "You will not be able to seal your own financial information," she told lawyers for Apple and Samsung. The court heard similar requests from several other companies that risk having some of their business dealings made public by the court. Lawyers from Intel, Motorola Mobility, Philips, IBM, Research in Motion and InterDigital asked Koh to allow contracts and royalty rates to be kept private. Koh indicated she was more likely to accept such pleas from companies that had been brought unwillingly into the case. On another issue, Koh said she won't approve a Samsung request for lawyers to switch seats when they are in the offensive and defensive parts of their case. The plaintiff in a court typically sits closest to the jury, and Samsung had asserted that sitting in the traditional defendant's place when fighting its case would put it at a disadvantage. Presiding over a courtroom already packed with audiovisual equipment and extra chairs, Koh rejected the idea of having each side change seats. "We're so congested," she said. However, after a request by Samsung, Koh did allow a change in the terms used to refer to each company. Originally, Apple was the plaintiff in the case and Samsung was the defendant, but the case was expanded to include one in which the companies were in the reverse roles. The original labels have been used to date, but Samsung is worried that being constantly referred to as the defendant could harm the offensive portion of its case. Koh suggested they switch the plaintiff and defendant titles during different portions of the case, but then quickly came up with an even simpler solution: to refer to the companies by their names during most of the case. Jury selection is scheduled to begin at the federal courthouse in San Jose on Monday morning. The two sides must find ten jurors out of an initial pool of about 70 people. 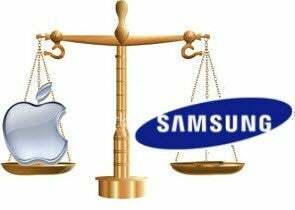 The case is 11-08146, Apple vs. Samsung Electronics, in the U.S. District Court for the Northern District of California.